When you think of impressive architecture and strong building materials, the Ancient Roman times probably come to mind. Many concrete buildings, roads, and harbors are in place more than 2,000 years after their construction despite natural disasters, weather, war, and more. But what makes Ancient Roman concrete so strong and amazingly durable? Here we unmask the secrets. The biggest reason the concrete of Ancient Roman times was so durable is because of how it was made. 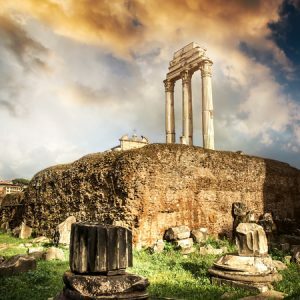 Somehow, the Romans had discovered the perfect mixture of just the right materials to use to create a rare chemical reaction between the concrete and seawater that essentially reinforced the concrete and made it even stronger. No one has uncovered the Romans’ concrete recipe or had any insight on it for years, but a recent chemical analysis revealed that it was made of quicklime and volcanic ash. When the concrete mixture combined with the seawater, a strong calcium aluminum silicate hydrate bond was formed. What does this mean to the concrete industry today? Studies conducted with ancient Roman concrete have been used to make stronger, more environmentally-conscious mixtures of concrete. The adoption of ancient blending techniques with substitute materials such as fly ash from coal burning plants could very well lead the way in terms of concrete innovation. Present day concrete isn’t made from volcanic ash and quicklime, but care is taken to make it strong and durable. At Templin Concrete, we have years of experience and training in concrete to make sure what we pour is able to last for years to come. When it comes to concrete, whether it be a new driveway or even a counter top, you want something that will last. You can’t get concrete from ancient Roman times today, but Templin’s Concrete is the next best option. Call us today at 612-388-1945 for all your concrete needs.